Father Bix gratefully accepted the 2014 grant from the Kelly Ann Brown Foundation. It came at a particularly difficult time. His dear friend Lynne Greenwald, a fellow peace activist and resident manager of the Irma Gary House, had just died. Bix himself had undergone four unsuccessful eye surgeries that have left him with blurred and partial vision, at best. Despite these set-backs, Bix is eager to use the grant money to return to ﻿Jeju Island﻿. "A Peace Delegation of nine people and me are traveling November 9th to the 20th to the South Korean island of Jeju. There we will join in the resistance to the construction of a naval base that will service U.S. vessels of war. The resistance comes from villagers of Jeju Island along with religious and lay-people from South Korea. They have been at this for seven years along with Bishop Peter Kang of the Jeju Diocese who has been an inspiration for the ongoing resistance. 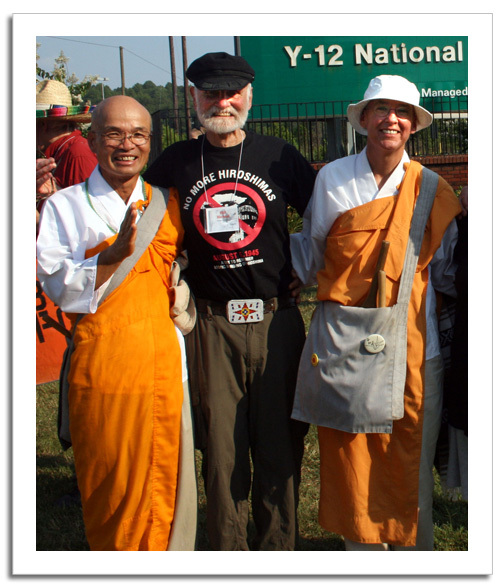 He has invited people of all faith traditions to join him in the non–violent opposition to the naval base. Over ten years ago the Island was designated by The United Nations as an international Island of Peace. Now it is being converted from a place of peace and healing to a base of violence and endless war. The people of Jeju and South Korea do not want this. They have suffered enough from war and occupation. Our trip to Jeju Island is in keeping with our work with the Ground Zero Center for Non-Violence which focuses on the abolition of Nuclear weapons and the Trident Submarine. The base will be a port for U.S. vessels with nuclear weapons capability. Besides the possibility of servicing Trident Submarines, the base will accommodate the Aegis Destroyer with its missile defense system. Though the naval base may be completed, the faithful day by day resistance over the years has created a deep pool of grace from which people of peace can draw nourishment and strength to continue the work of peace and resistance to the works of war." Click here for more information about Father Bix.